So we decided to spend some good time in the kitchen together (which we are not getting a lot lately!) and create some food. On being asked what she wants to create the answer was “marshmallows.. No No..egg. No wait, marshmallows is fine!” Now creating marshmallows with a two year old might be little tricky so we decided to take the easy route and baked some cookies with marshmallows on them. I had this recipe bookmarked in my computer which was very easy to put together and perfect to make while having fun, so I chose that. I made a few variations so that it gets easier for the two year old and also exciting to see what she could do all by herself. I was surprised to see how well she measured the flour and broke the eggs. Well, when it came to measuring sugar and melting chocolate I could understand why she was a little sneaky but I was surprised to see how well she did. She patiently cut each marshmallow and waited in front of oven with arms closed and tapping her toes while the cookies were baking. And when the time came to drizzle molten chocolate on top of the cookies, the sparkle in her eyes and that smile on her face could tell how important it was for her to “create that food” all by herself. They came out perfect, soft chocolate cookies with gooey marshmallows and rich chocolate worked well together. Later, all three of us sat down to enjoy those warm cookies with a warm heart! The recipe I used for these cookies was from the MarthaStewart.com. I tweaked it a little to make it easier for the little one to manage (under my constant supervision and with a little help of course). I omitted the whole frosting part completely and instead just melted some dark chocolate with some heavy cream and the little one drizzled it on top of the cookies when they cooled down. In a mixing bowl whisk together flour, cocoa powder, baking soda, and salt. Set aside. In an electric mixer cream butter and sugar together until they turn light and fluffy. Add egg, milk and vanilla. Beat together until they are well combined. Add flour slowly on low setting until they are combined. 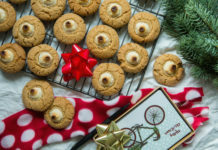 Line a baking sheet with parchment paper and then using a spoon or ice cream scoop drop batter on the baking sheet about a couple inches apart from each other or when you bake the butter melts, cookie spreads and they stick to the ones next to them. Let them bake for 10 minutes. They bake up fast so keep an eye. Mine burnt on the bottom when I baked them for 12 minutes at 375 deg. F.
In the meantime cut marshmallows horizontally into halves. Take the cookies out of the oven, place one marshmallow half (cut side down) over each cookie. Put them back in the oven and bake for 3-4 minutes. Transfer them to a cooling rack and let them cool before frosting. While the cookies cool melt chocolate chip cookies with cream in a double boiler. Once the chocolate melts whisk it thoroughly mixing cream and chocolate together making a think paste. Now you can either transfer this ganache into a piping bag or using a spoon drizzle it over the cookies. I never read such beautiful article before. As well as browsing an individual’s articles or blog posts repeatedly. I just visit this blog first time and read its post entirely and really got a lot of knowledge from here.. When I was looking for an eggplant dish, I ran across this cookie recipe. One word. AWESOME! My kids loved these and made eggplant as the main course more bearable for the youngsters. Thanks so much for posting! Lovely recipe.. I’m going to try this out. Any idea if I can make this using a micro?? When you have a quickie moment check out details for the Chocolate Adventure Contest I have posted at FFC ~ I am sure you could come up with AMAZING submissions! These cookies look amazing and your little girl is adorable!!!! So so sweet! Aw such a cheerful and uplifting post, you and your lil one look so adorable there! i can imagine how ur baking would been, so much full of FUN!! Update: I made these cookies for an Oscar party at home last Sunday. Needless to say they were delicious. I love the soft and light textures of the cookies against the chewy marshmallows. Aww… you guys looks adorable! You definitely have a “mini you” on your hands. I’m a firm believer of bringing kids into the kitchen and having them “create’ with you. This is only the beginning!! These are the memories which are always so precious, she is so cute!! Two of you together… Beautiful!! She is just so cute:)really really squishy mushy hugs to her. It is so much fun working with them in the kitchen. Do this few times and see her rattle off the ingredients by proportion one after another! kudos to the baby (but budding) baker. Those cookies look delicious. The two of you together is precious. Too cute! A little you in the making!! Keep making those sweet memories 🙂 And delicious cookies! A looks so cute. Loved the expression in the first picture. I can imagine the excitement she would have had during the whole session. The cookies look so gooey and tasty! Sharing the cooking experience with your child could be a great idea for some parents. Thank you simplifying this recipe so little ones can enjoy cooking as well. This is such a lovely post! I dream of doing this with my daughter as well one day (she is too little as of yet)…how proud I would be if she also told me she wanted to “create food” 🙂 Your little one is gorgeous! And these cookies look and sound delicious! How adorable! I loved cooking with my mum and grandma when I was little. The cookies look absolutely delicious. Just fabulous …i love your blog and am blaming u for all the undone things in my to do list today :)!! having spent a big part of morning at your place and enjoyed everymoment of it !! How fun, I am sure your daughter is going to cherish these wonderful memories with you in the kitchen. Those cookies look amazingly delicious and I am going to make these this week for a party. She is beautiful and seems to have a natural talent! That time spent with her in kitchen is precious, I am sure it will make really fond memories for her. You have a really adorable daughter and looks like she knows her way around the kitchen at a very early age. I enjoyed reading this post. I am sure to enjoy baking these cookies too. Thanks! Aww your daughter is so sweet. It’s wonderful she wants to be just like you and create food! These are deeeeeeeelish! Your daughter looks even sweeter and lovely than those chocolate cookies! counting her teeth every night? That is so cute…. Those moments when you believe teeth grows overnight… Pure innocence! 🙂 These cookies sound and look and judging by the tiny hand trying to reach for one, addiction! She is so sweet! And she made some awesome cookies! I can only imagine how great she will become! I love that your daughter likes baking with you. So sweet 🙂 I remember baking with my mom all of the time. I must admit, I liked eating the cookie dough more than I actually liked baking. *hah* But now I share my mom’s love of baking itself (although, I still steal a bit of cookie dough now and again). These look so yummy. The frosting really makes these pretty! Cute post 🙂 cookies look yum,. The cookies look very delicious and please tell her that she is an excellent baker! What a gorgeous and fun little kitchen helper you have! I’ll bet the addition of little hands made these cookies taste even better. Prerna, she is sooooooooo adorable. Very cute. By the way pretty cookies and well captured clicks. Yah its really fun to work with the kids in the kitchen and I am enjoying with my kid too. Awesome !!!! She’s adorable! I think this is a fantastic recipe, looks gooey and delicious! Not surprised at all that she has such expertise in her! So cute!!! I love it. How cute!! Ur kiddo and the cookies she made are adorable. Can’t wait to bake with my daughter, maybe soon!! Everyone loves surprises and in this post we got two. The cookies and the cook! Great cookies! Your daughter is such a darling. Lovely post, Prerna! Your lil A is growing up pretty fast and I’m surprised to see her in kitchen at her age. 🙂 Cookies are perfect too.